In the early 1990's, several teams stepped up in the Monster Truck racing game to put Chevrolet back on top. With improved suspension systems and a longer wheelbase chassis aided by computer designs, the need for a specialty body was created. The "Snoop Nose" fiberglass body was used by the Chevy boys which featured an extended wheelbase, larger wheel well openings, and of course, a low-slung front clip which gives it that "snoop" appearance. 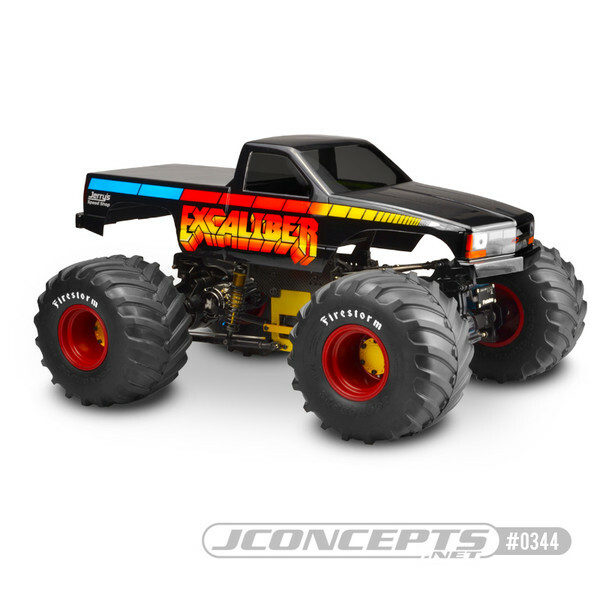 JConcepts revives a cult favorite with a completely redesigned body for solid axle monster truck racing. The 13" wheelbase is perfect for the solid runners in today's racing and with a proportioned width and "snoop nose," the Chevy, is definitely a cut above the rest. The tucked front nose provides clearance for an assortment of tires such as the Renegades and Firestorms while the shaved front and rear bumper faces the competition like a fighting bull. The main structure of the body remains a genuine Chevrolet style used from 1988-1998 and deep down represents the "Heartbeat of America" generation. The JConcepts body includes a clear body shell, paint mask for all windows and detailed Chevy and JConcepts logo decal sheet. As always, each body set is backed with JConcepts customer support and racing heritage. One Clear lexan body (.040 thickness). Window masking, taillight, headlight, and grille decals. SPECS: Length: 18" (460mm) Width: 7" Wheelbase: 13"
Shipping Charges: Our standard shipping charge for this product is $8.50 for the 1st item and $5.00 for each additional body. This product was added to our catalog on 10/19/2017.